much love, illy: are you insured? 'cause Flo and Mayhem gotcha covered! THIS IS THE CUTEST COUPLES OUTFIT!!! YOU TWO ROCK AS FLO AND MAYHEM!!!!! Seriously AMAZING! You are the best. That is adorable! LOVE this costume choice. 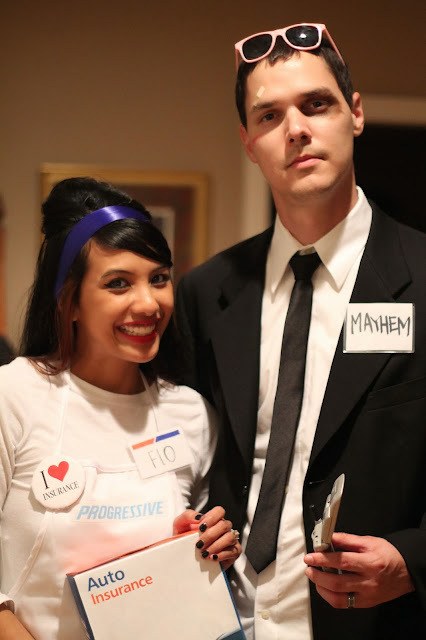 As i mentioned on IG yesterday, I saw your Flo costume, and was totally like "Ryan should go as Mayhem!" and then BOOM. I see it. Crazy good idea for costumes! Okay, you two are the cutest!! LOVE this idea!!! :) Happy Halloween! This is perfect and made me laugh so hard! Of everyone I know that dressed up this year, you two are my favs! you and your husband are fantastic. <3 this idea! Great costumes! I sadly didn't get any halloween candy this year. Le sigh. A blog reader tried to send me some, but I think it got lost in the mail. This is awesome. I love that he wore it to State Farm too. Ha!